As a regional leading manufacturer of lubricants, our company had built first-class production lines, equipped with advanced production equipments and sophisticated testing equipments. Annual output capacity could up to 80000 tons per year. 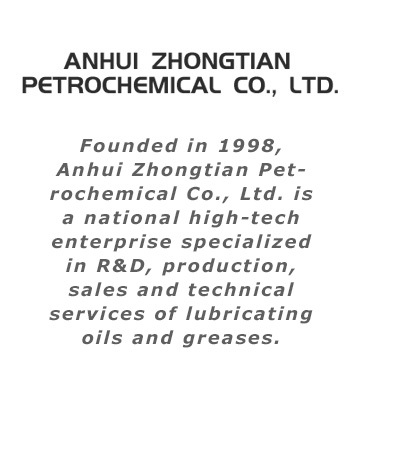 Lubricating oil Anhui Zhongtian Petrochemical Co., Ltd. which was founded in 1998, is a national high-tech enterprises engaging in R&D, production, sales and technical services of lubricating oils and greases. Our company is located in Susong Economic Development Zone, which is the intersection area of Anhui, Hubei and Jiangxi province, also the centre of the Yangtze River economic Zone, where Hefei-Jiujiang Railway, Shanghai-Chongqing high-speed and 105 National Road pass. It takes two hours by car to provincial capitals such as Wuhan, Nanchang and Hefei. The company has advantages of convenient transportation and unique geographical. As a regional leading manufacturer of lubricants, our company had built first-class production lines, equipped with advanced production equipments and sophisticated testing equipments. Annual output capacity could up to 80000 tons per year. Lubricating oils and greases are our main products, totally more than 500 types, which are widely used in industrial and agricultural equipments, transport vehicles, national defense & military equipments and civilian facilities etc. 60 types of them have reached domestic leading technology level and cutting-edge level in the world. The company's total assets is up to CNY200 million, overall strength ranking first in Anhui Province and top five in domestic of the industry in terms of production capacity, brand effect, technology development and financial strength.